Off limits! This is the Dunton townsite. It's across a large creek and the bridge has a gate. Only the initiated are allowed in. It appears to be a combination of preserved and restored buildings. The day I was there, June 18th, 2010, it was quite busy. For years I’ve driven by a mysterious sign that’s just south of Lizard Head Pass on Colorado Highway 145. It says there’s something called Dunton along the road. I tried my street bike on it, but turned around because it was clearly the wrong vehicle. The road isn’t bad, as it turns out, but my dirt bike was a far better vehicle. So, on June 18th, 2010, I rode my street legal bike and traveled the road. I expected adventure. I got high adventure. Here's the sign that's intrigued me for years. I followed it expecting adventure. What I got was high adventure. The road is generally well-graveled and any four-wheeled vehicle should have little or no trouble, at least on the roads I show in the GPS maps as being good roads. Let me first thrown in a couple photos of spectacular views, then we’ll crawl through the GPS tracks. View of the mountains once I passed Dunton, heading west. 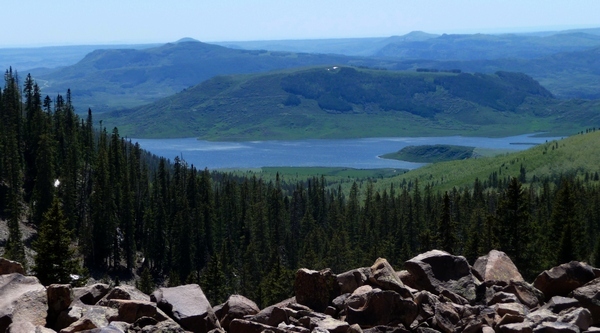 View to southwest, looking down on Groundhog Reservoir. Quite a view! This was taken not long before I turned onto the rough road. Now, let’s crawl through the GPS map. I have three: one of the entire trip, one a detail from Highway 145 to Dunton townsite, and one from there to the point where I had to bail to the north over a rough Forest Service road. This GPS track covers a very large area--this was a several hour ride. The loop was taken clockwise. The really rough section, FR 615, is highlighted. At no point did I travel cross-country. Okay, that map covers lots of territory. 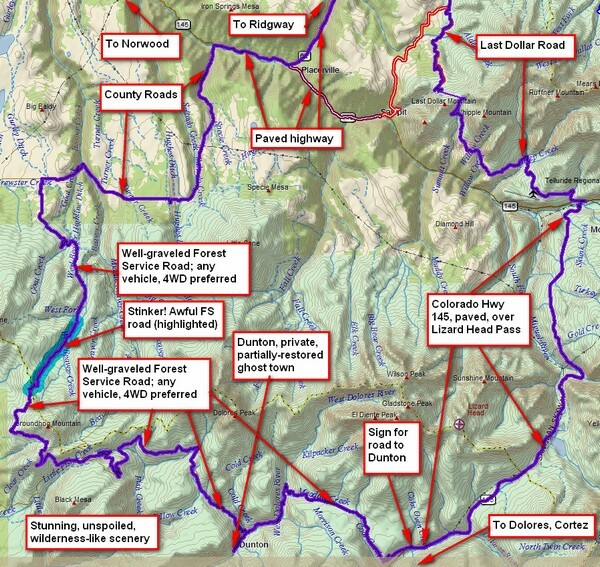 I started in Ridgway, rode Colorado Hwy 62 (paved) to Last Dollar Road (not paved; see separate posts here and here), and down Colorado Hwy 145 (paved) up and over Lizard Head Pass to the Dunton Road turn. The map below shows much more detail of the road from Colorado Hwy 145 over to the Dunton townsite. The road is well-maintained and should not present too many challenges to any vehicle, though the loose gravel is more of a challenge on my street bike than I wanted to undertake. My Yamaha XT-250 “dual sport” dirt bike had no problem. I was disappointed to see that Dunton remains in private hands and that no one other than those invited may proceed into the town proper. On the day I was there, the place was crawling with people, including many children. But a locked gate prevented access to the bridge and there was someone at the gate to check your ID. From there I had intended simply to retrace my path, but a bit north of Dunton was a road that looked simply too tempting, so I continued on west along the well-maintained Forest Service Road. (I didn’t take pictures of the sign itself, but believe it is FS 305. If you find differently, please let me know.) The road is in excellent shape, again suitable for any vehicle. It headed west and up over some hills and then ran along the sides of the mountains giving a stunning view to the south. Here's the track I followed. I ran into several intersections and kept chosing the more northerly routes. The problem I was running into was the road kept winding generally westward to the south of the mountains south of Norwood. I wasn’t finding any road to the north. After awhile, concerned about the time of day, I studied my DeLorme PN-40SE GPS, to see what I could find. I at least learned that I was now on Forest Road 534. Now the maps in the GPS are the same as presented in the base map for my tracks. As you can see, there are a number of areas where the base map departs from reality—I generally trust the GPS track to within a few hundred feet. I ended up choosing Forest Road 615, which showed on the GPS as heading north to another road complex on the other (north) side of this little range of mountains. So, I took it. Well, it’s all of three miles long and took me a half hour. It could barely be called a road—a Jeep or pickup could only make it if it were thoroughly dry, which it most certainly was not. Not only did I encounter endless mudholes, most of which were placed so as to be unavoidable, but the creek seemed to think flowing down the roadbed was the right thing to do. Add to that many embedded rocks and the whole thing was dicey. My average speed was 6 mph, only about twice walking speed. Even the awful road between just south of Ouray and Engineer Pass can be traveled about twice as fast. Anyway, I survived and came out on a well-maintained gravel road. From careful study I should have taken an earlier cutoff. I had attempted it from the south, but quickly came across a downed tree, and decided to move on. Bad decision—I should’ve stuck with the first road. Live and learn! Once over the hill, travel back home was pretty easy. The only interesting part was working my way through a large herd of cattle being pushed down the road in the same direction I was traveling. I should’ve taken a picture, but at the time I was intent on gently working my way through without getting trampled! All in all, an interesting exploration. There are dozens of side roads I left unexplored. I didn’t see any trails designated for ATVs (double tracks) or motorcycles (single tracks). This entry was posted in GPS Tracks, Motorcycling, San Miguel County. Bookmark the permalink. Not that I know of, but then I’m not familiar with the area. My ride that day was one of exploration, and I should admit I got lost! There are many other trails besides the ones I went on. It has been several years since I took the Dunton Loop Ride. 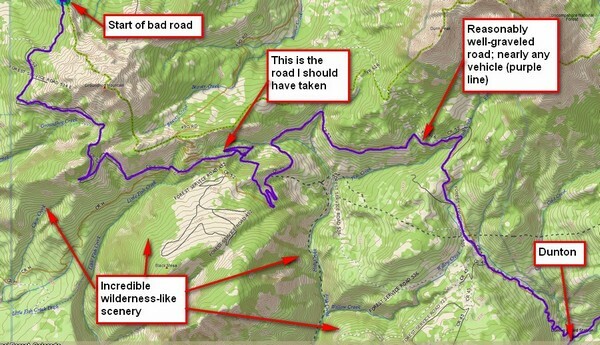 Any trails on this loop to bypass the paved road?